Apple initiated a price hike in the flagship field with the iPhone X, but the anniversary phone experienced relatively weak demand. TrendForce estimates that Apple’s sales will be flat compared to this year and reports that the company will alter its pricing strategy to answer the pressure from Android phones in general and from Chinese brands specifically. To do that, it’s preparing three new models – two premium ones with AMOLED screens and a more affordable one with an LCD screen. All three will have FaceID. That coupled with the larger 6.1” LCD compared to the outgoing iPhone 8 will lead to a small increase in price – the analysts predict that the most affordable new model will have a price in the $700-$750 range. This model may also come a bit late as mass production is scheduled to start in mid-September while the AMOLED models have been in production since late July. Anyway, the two premium AMOLED models will have 5.8” and 6.5” screens respectively. The 5.8” model will represent a discount compared to the iPhone X, its expected price is $900-$950. The X starts at $1,000 and due to its overall similarity with the 5.8” model, it will reach its end of life stage earlier than usual. Finally, the cream of the crop, the 6.5” iPhone will likely stick to the $1,000 price tag and not go over (at least for the base storage) in order not to discourage buyers. The Apple Pencil will be compatible with the new iPhones aiming to challenge Samsung’s Galaxy Note lineup. 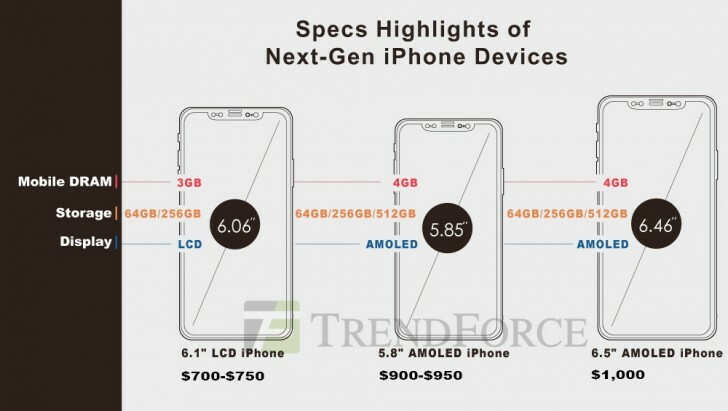 TrendForce believes that the 6.1” LCD iPhone will be the main model this year as it will make up 50% of the production. It’s expected to have a dual-SIM version, potentially exclusive to China where Apple has been struggling to maintain market share (against affordable dual SIM Androids with flagship specs). Apple has reportedly been pressuring its component suppliers to drop the prices in order to maintain its profit margins. says the user with the name Galaxy note 9, which is anything but a cheap phone. Lol this comment section is gold. Normal boring apple article also got stupid commenters. itÂ’s amazing after 8 years, android fanboys still hating on Apple with the oldest, most outdated facts/reasons.